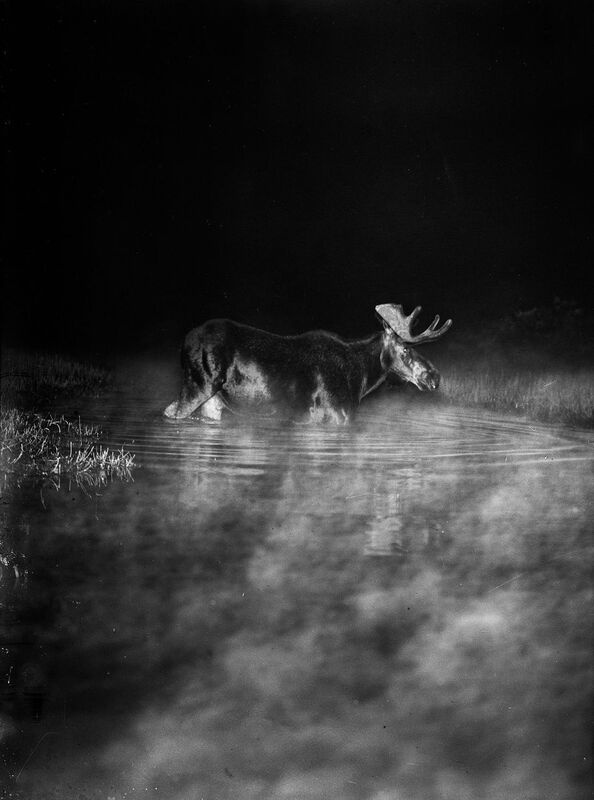 In the late 19th and early 20th century, photographer George Shiras lived something of a double life. During the day, he served as a successful lawyer and politician, eventually becoming a member of the House of Representatives for the state of Pennsylvania. 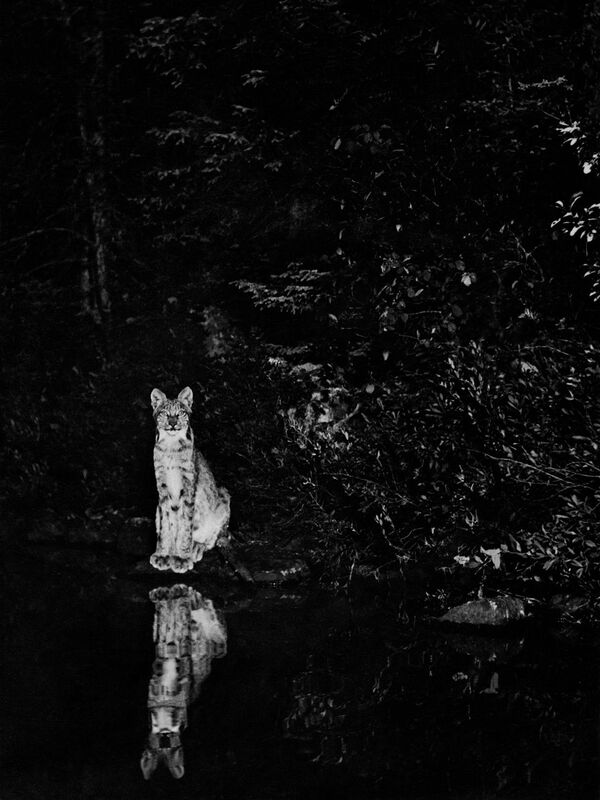 At night, however, he roamed the black wilderness from Allegheny to Lake Superior, photographing the deer, lynx, raccoons and other wildlife that passed by. An avid hunter growing up, Shiras is known for incorporating elements of sport into his artistic practice. 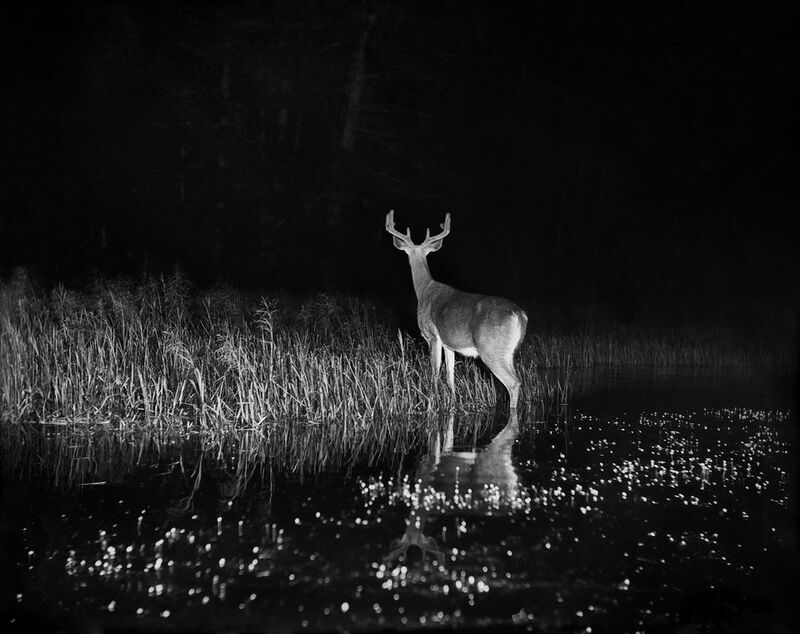 When he began photographing in 1899, he took inspiration from a hunting technique used by Ojibwa tribes called jacklighting. He would place a kerosene lamp at the front tip of a boat, while he sat quietly in the bow. The light would catch the gaze of animals who happened to pass by, leading them to pause momentarily in a captivated trance. Then, Shiras would snap his camera, aiming between the eyes of the animals, which catch the light of the fire and take on an eerie gold glow. 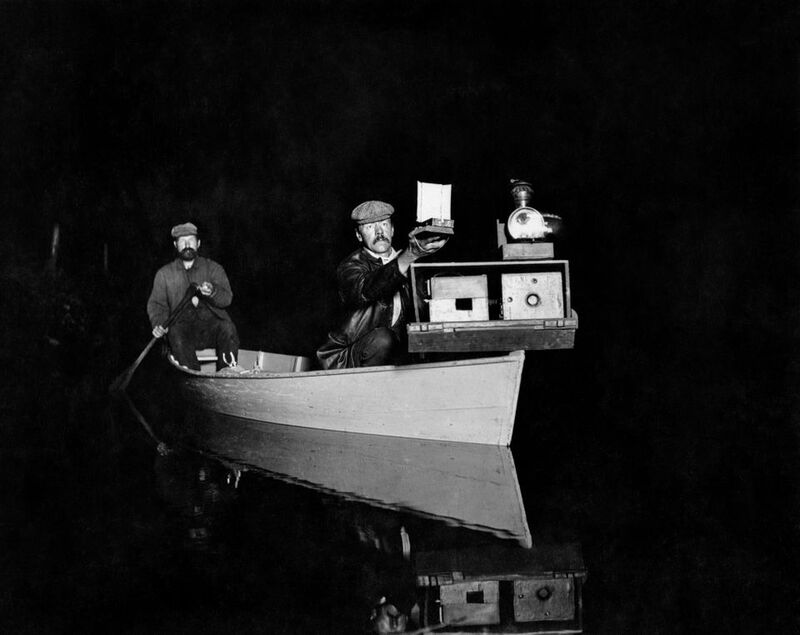 In July of 1906, National Geographic published 74 of Shiras’ photographs in a groundbreaking article titled “Hunting Wild Game with Flashlight and Camera.” It was the magazine’s first time publishing wildlife photos. As a result, two National Geographic Society board members resigned in “disgust,” claiming National Geographic was en route to becoming a “picture book.” Five years later, Shiras himself filled one of the empty spaces himself, becoming a member of National Geographic’s Board of Managers. Aside from being an innovative artist, Shiras was a monumental conservationist as well. He discovered a moose subspecies in Yellowstone National Park and initiated the creation of several other national parks and refuges. He also fought to replace “rifle hunting” with “camera hunting” as a way to capture the beauty of the natural world without lethal consequence. Shiras, who called President Theodore Roosevelt a supporter, argued that photographs were greater trophies than the animals themselves. He was as close to an art world superhero as it goes. 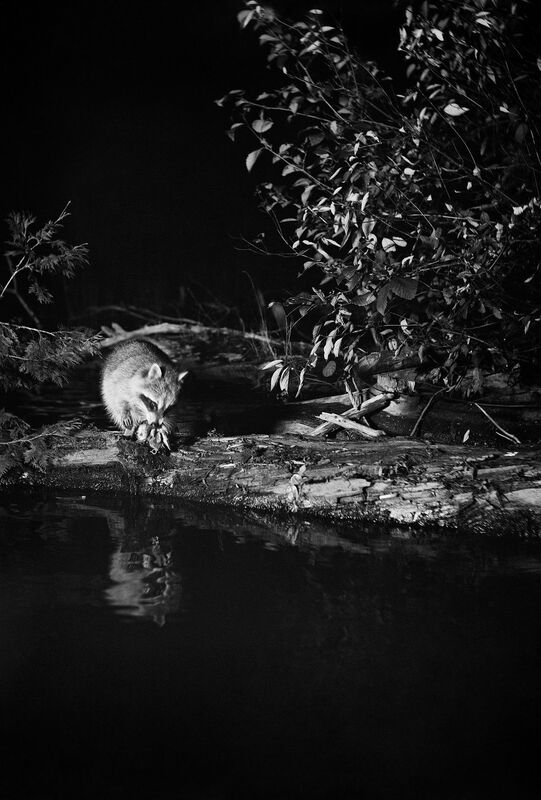 Wildlife photography, camera hunting, experimental art making — whatever you call it, Shiras was a turn-of-the-century pioneer whose work seamlessly combined politics and poetry, capturing the beauty of the natural world while fighting to protect it. And now, nearly a century after his National Geographic debut, an ongoing exhibition in Paris, entitled “In the Heart of the Dark Night,” is chronicling Shiras’ pioneering methods and gorgeous early images. 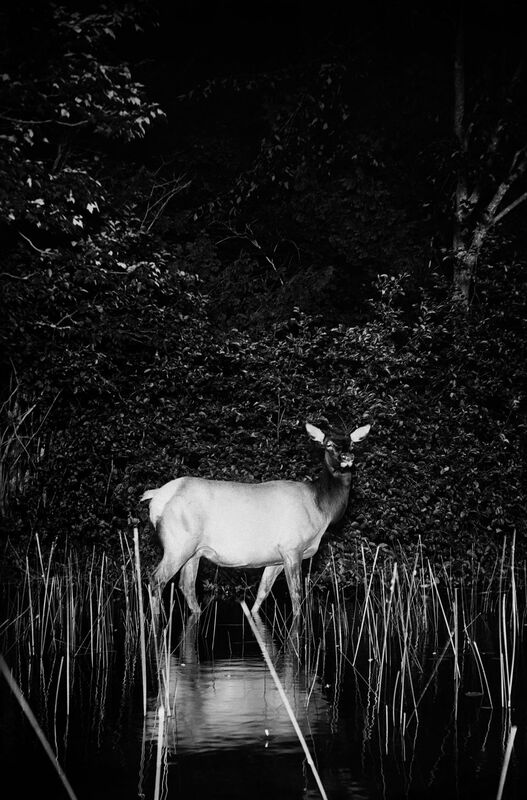 When I first discovered Shiras’ photographs, I was struck by their beauty and eeriness. But beyond the poetic element that emanates from these pictures, there is something more. Their experimental and committed nature distinguishes them from the images of certain 19th-century painters and photographers, with their portrayals of a nostalgic, idealized nature, unspoiled and authentic. The photographer passed away in 1942 and, despite his enormous impact on the future of wildlife photography, his name and work remain widely unknown. “In the Heart of the Dark Night,” on view at Musée de la Chasse et de la Nature, chronicles the influential artist’s massive contributions to the fields of art and conservation, introducing the icon to audiences who’ve yet to understand his influence. The monochromatic images, cloaked in darkness and punctuated with piercing glimmers of movement and light, show a world most of us will never encounter in person, a world that may never have been documented if not for the fierce imagination of an unlikely politician. 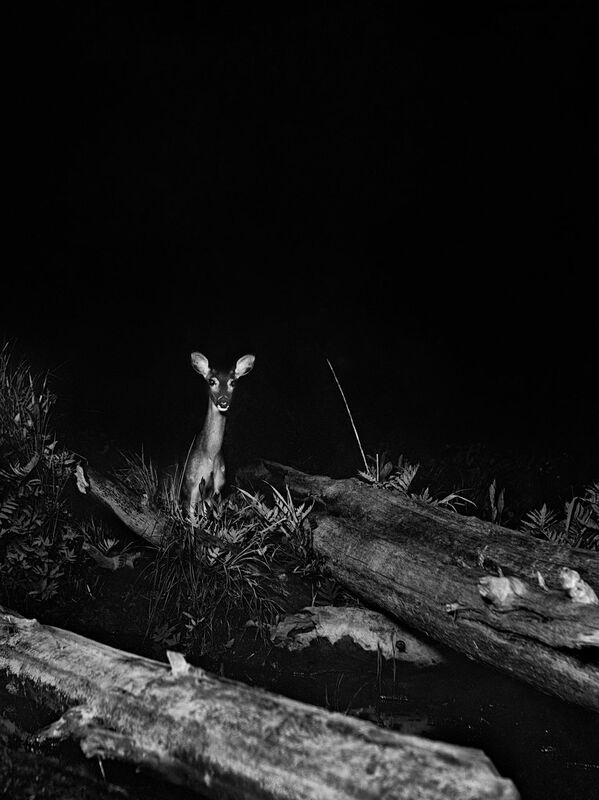 “In the Heart of the Dark Night” is on view at Musée de la Chasse et de la Nature until Feb. 14, 2016.